The Health Information Technology for Economic and Clinical Health Act (HITECH), passed as part of the American Recovery and Reinvestment Act (ARRA), added new categories of violations and increased fines for HIPAA non-compliance. The Office for Civil Rights (OCR) within the Department of Health and Human Services is vigorously enforcing these new rules. Using lessons learned from previous OCR audits, investigations, and enforcement actions, our team of subject matter experts helps you minimize your compliance, financial, and reputational risk. Clearwater assisted us throughout the OCR Investigation process. As a direct result, we were able to negotiate a potential $3.9 million civil money penalty down to a $0.4 million negotiated settlement amount. 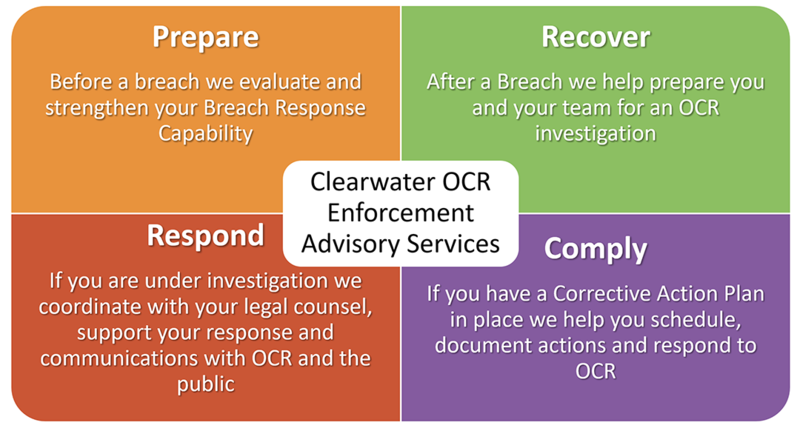 Interested in how we can help your organization with OCR enforcement advisory services? Download "Responding to an OCR breach investigation with an OCR-quality risk analysis"